Crossing the Arabian Sea - This week we find ourselves 2/3 of the way across the Indian Ocean, in the part known as the Arabian Sea. We have always read of this as another 'milk run', with trade winds 10-15, always from abaft the beam. Well, as many other times 'the weather is never like this' when we get there, so we have had light (or no) wind for several days, as well as winds from the north-west, which has pushed us south of our rhumb line, and made us sail close-hauled for the first time in quite a while. However, the last couple of days have brought gentle breezes and we have even dragged out our light-air drifter to add color to the rig. We have had a few encounters with dolphins, and a sea bird that hitched a ride, and are looking for whales reported by other yachts ahead of us. All in all, not a text-book crossing so far, but no real complaints! 'Get out of our patch of the ocean' - As we travel at night, we often keep our radar on, and as it sweeps out a 450 square mile area around us, we get downright indignant when another ship intrudes in our space. We fret a bit, call them on the VHF, listen in frustration as they ignore our calls, and then prepare to dodge them if they get too close (we're talking 2 miles being too close). It warms our heart when the person on watch answers us, most recently with an Italian accent, and confirms that he has seen us and will change course to avoid us. Often though, they still sneak close to get a peek at our little 38' vessel as it plies the same ocean as his 400' ship full of cars. Give a tow - Late last month Talinga Too diverted in mid-ocean and towed Tramontana, a bigger yacht, 60 miles into Galle. Help with lines - Galle harbor is set up so that lines need to be tied spider-web style to keep yachts in place. Each of us, in turn, launched dinghies and sweated with the lines for others, secure in the knowledge that they would do it for us when the time came. Help disabled yachts - When Limbo arrived at Uligan out of fuel, the yachtie nets bristled with ideas on how to get them into the atoll safely, and interceded with the authorities to get fuel delivered to them as they approached. No bad weather - Bad weather relieves the boredom by keeping us up at night, making us change clothes often, and frustrating us, as well as being dangerous. No broken gear - Equipment breakage can fill lots of ones time and avoid boredom. No close calls - Every 10 minutes, 24 hours per day, one of us scans the horizon looking for a dim light or hard shape indicating a ship is near. A ship sneaking up at night to within a mile really relieves the boredom - we prefer to be bored. I guess we prefer to be dull people while on a passage, how boring! Crossing to Oman - As this week dawned, the winds freshened and for 48 hours we had winds in the 18-25 knot range with large seas - 'boisterous conditions'! This drove us first south and then north of our rhumb lines as we tried to avoid taking seas on our beam. It was a wet and uncomfortable couple of days, but moved us along at 115 miles/day. On the last day, with Oman 60+ miles away, we turned on the engine and motor-sailed down wind at 7 1/2 knots and squeaked into the harbor at Salalah, Oman as the sun was dropping below the yardarm. We celebrated our safe arrival with thanks to Neptune and a cold drink (or 2) as we joined 12 other yachts anchored in a modern-looking port. Officials - They came to the yacht, were quick and efficient and within 1/2 hours had surrendered our passports and were officially in the country. Since we have no visas to roam the country, we are bound to remain at the Port except for short visits outside. We get a pass, which is stamped for a day visit, and then can travel locally as long as we return before 11PM. Mohammed - One of the port workers has set up a side-business serving the yachties, and Mohammed visited us with his flowing white robe to offer rental car, tours, or other services. He is a very handsome and charismatic young man that makes life easier for us travelers. Beige and white - These are the colors of the desert and the cities, beige sand and white buildings and mosques with colorful minarets. Black and white - These are the colors of the clothing - Omani men generally wear white robes with a colorful head turban, the women wear black with a veil. But there are many foreign workers, Indian, Sri Lankan, Westerners, and foreign forces so that people on the streets could be dressed in almost any attire. Modern and wealthy - The highways are wide and divided and the cars new in this country that makes its living by selling oil to the world. The city of Salalah is ancient and used to be the capital of the Oman empire that covered much of Africa and the Middle East. Now it is a port city with modern, but plain buildings, good shopping and friendly people. They are not predictable 'milk runs' - Contrary to the Pilot chart predictions, one cannot depend on moderate trade winds on the quarter to move you along. In both cases we have encountered winds with speeds from 1 to 30 knots (outside of the cyclone season), coming from close hauled to dead down-wind directions. Indian Ocean has lots of sea-life - Although we were not privileged to see any whales (yet) other yachts have reported hump-backs, pilot whales, orcas, and pods of hundreds of dolphins. There are lots of fishing vessels out there, but abundant sea-life. Family Restaurants - On our first night ashore we went to a local restaurant. It is set up with private rooms, where we sat on the floor and chose meals from a generous menu. The 5 of us selected Omani and Indian dishes, ate with our fingers, and had a great time. The waiters always knocked before they entered the room, and we believe the whole system is set up so that women can remove their veils since they will be only in the presence of their family. Coastal drive - West along the coast are dramatic cliffs and beautiful beaches so we drove about 30 miles to a check-point - beyond it was the road to Yemen, but it was closed to us. The check-point was manned by heavily armed soldiers with machine guns and armed vehicles. Camels - They are everywhere! From the front gates of the Port to the highway north of town, they roam through the countryside and on the highways. Big, little, dark, and light they are arrogant and do NOT get out of the way of vehicles. They are known to be valuable, so we gave them a wide berth. Friendly people - We have found all of the people to friendly - we shake hands with anyone who approaches, and many want to know where we are from. Some people have been invited home for dinner, and at market stalls people will engage in friendly conversation. Frankincense - The Christian Bible lists frankincense as one of the gifts brought to Jesus by the three magi, and Oman is the source of frankincense. We visited a market near the palace of the Sultan of Oman, and scores of vendors sold this aromatic pitch from a small shrub that grows on the surrounding hills. 1 riyeal (about $US3.80) will get you about 1 pound of 'the best' stuff, as described to us by the merchant we visited. He also happened to be a chemical engineer graduate from U of California at Long Beach and was moon-lighting at his own incense and perfume shop. Impending confrontation with Iraq - We talked with some young men at a small village north of Salalah, and got onto this subject. Their view is that US people are good, but their government has it all wrong in planning to attack Iraq. They believe it is all about control of Iraq's oil fields, and feel Bush is 'bad'. 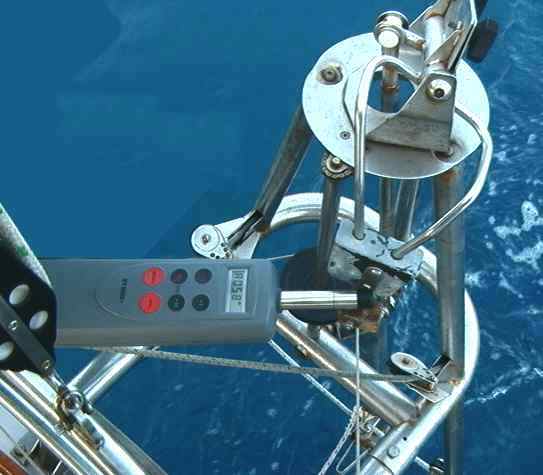 Broken windvane - We hit a crab-pot buoy on the way into Salalah and broke a stainless part on our Monitor windvane. We found a place to weld it, and it is back in place, albeit with a slight scar. Overheating autopilot - The last couple of days the autopilot had been overheating with no apparent reason. We found a broken guide wheel inside the unit, and have repaired it. No way to know for sure if this was the cause, but it is likely. Defective regulator - We have been plagued by a problem with charging the batteries for several weeks, and upon arrival ordered a new regulator from West Marine. It arrived with 4 days. duty was minimal, and we had it installed and running within 4 hours. Currently we anticipate a Saturday 15 March departure with 2 other yachts: Herodotus and Limbo. There have been 2 recent piracy incidents, so our adrenaline level is up, and we will not sleep comfortably until we clear the danger area off of the coast of Yemen. 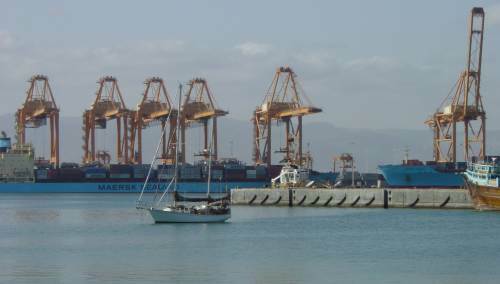 On the Move - We left Salalah mid-day on 22 March for the Red Sea. We plan to sail directly to Massawa in Eritrea in company with Tara 3 on a 1200 mile passage. If fuel runs low, we plan to pull into Aden, about 7 days from Salalah. False Start - This is what happens when we write our journal before the week is completed - events tend to make the prediction obsolete. One hour out of Salalah, our venerable autopilot started to over-heat and wandered wildly in course +/- 20? and after experimenting with it for over an hour of motoring sou'west in light winds, we decided to turn back to repair or order a new one. Our traveling companions, Herodotus and Limbo, wisely decided to press on (they are nearing Aden, 700 miles away as we write this). Autopilot Update - After reconciling ourselves to a $1000 order for a new autopilot, we continued troubleshooting the next day and found the root cause: the retaining washer on the steering shaft was missing (who knows how or when) and the autopilot was jammed in such a way that there was too much friction while steering. This caused the little motor to over-work, over-correct and over-heat. We fixed the problem, took Long Passages our for a several hour spin, and all systems appear to operate properly. Now we plan to leave on 22 March with Tara 3, a New Zealand yacht that arrived the day we made our false start. Veils - Most Muslim women in Oman wear veils of one type or another, ranging from merely a head-dress to slits for the eyes to ones where the face is completely concealed - they look out through the loose weave of the cloth. At night, we visited the gold shops, and the veils had fancy trim and sequins - but always black. Gold - We shopped in the gold and silver souq (markets) and found that the jewelry was cheaper than the cost of the gold. Judi succumbed to the temptation and bought a fine filigree piece. Desolate interior - Drives into the mountains around Salalah reveal barren and dry hillsides, suitable for grazing animals and not much else. Camels and more camels - We continue to be fascinated by these animals, that appear to be everywhere, and arrogantly stroll the streets and roads with scant regard for passing motorists. Liquor - It is difficult to find in this Muslim country. Near the port is the Oasis, a western-style restaurant with steaks and beer (and no signs to announce its presence) that we quite like. One of the super-markets on the local Air Force base sells liquor, but only if you have a police permit and buy in 10-case lots. Hand-shaking - We find we shake hands with everyone - shop-keepers, the guards every time we leave or return, and even hitchhikers that we pick up on the highways. Guards now carry machine guns at all times. Security has been tightened at the entrances. We have been confined to the base for 2 days. The local KFC was attacked, we don't know the extent of the damage. In Yemen, our potential next stop, protesters clashed with police and 1 person was killed. The port has accumulated 4 motor-launches so far from nearby Dubai in the United Arab Emirates - although they are reputed to be here just for the fishing. The editorial in the local paper, usually friendly to the US, points out that the US is confirming that it believes 'might makes right', and other countries will use this justification when dealing with neighbors they don't like. Piracy on the horizon - The big topic continues to be the possibility of piracy when transiting the Gulf of Aden. Two incidents happened in early March near the same area, and subsequently yachts have employed tactics to cross the danger area (between 49 and 48) at times of least danger. All yachts have transited this area recently with no problems. Arrival in Aden, Yemen - Well, we switched to Plan B and decided to pull into Aden, even though our fuel supply was adequate to get us to Eritrea. So far (one day) we have found it interesting, and as usual, the people are friendly! Formalities were a breeze, cost no money, and the only nuisance is leaving our passports in an official's office while we use our Shore Pass to leave the Port area. Run with either no lights or low lights. Keep VHF radios off if at all possible. Yell MAYDAY via all possible means if attacked. Yacht X - attacked a week earlier in same area. Initial contact - "This morning at 8 am Yemen local time Yacht A was in close company with 4 other yachts at 13?11 N and 48?40 E approximately 50 miles off the Yemen coast and 100 from Somalia in the Gulf of Aden: We spotted three fast moving motorized dhows coming across our track from the direction of Somalia towards the Yemen coast. I was just about give a routine position report in to a NET on the SSB radio where by chance M..., the skipper of YACHT X (a yacht attacked, boarded and robbed near here a week ago) was describing his attack." The attackers - "I broke in to his conversation and asked for a quick description of the boats that attacked him and his response described the ones approaching us. Local boats, 20 meters long, probably made of wood judging from their radar echo (only visible on radar within 1.5 miles) and inboard powered. They were covered with bright blue and orange plastic sheeting possibly to conceal their identity or their cargo. By this time we had formed a very tight group and had increased speed to the maximum we could sustain as a group - 6-7 knots. One of the three dhows had diverted and was heading directly for us from our port quarter". Shots Fired - "When he was about half a mile away we heard shots fired. We immediately called mayday. K... on YACHT B using VHF and I called the skipper of YACHT C and of YACHT X who were in direct communication with the German Navy HQ in Djibouti. They informed us that help was on its way but would take several hours. We repeatedly called Mayday on other channels but got no response. The boat was only very slowly overtaking us and as no further shots were fired an anxious ten or fifteen minutes followed as they gradually drew astern and we coaxed more speed from our engines. His other two companion vessels did not seem to take an enthusiastic part in the pursuit, both appeared heavily laden with people. All this time K... , I and some of the others kept up a barrage of Mayday calls and updating of the contacts that we had managed to make by the various radio frequencies." Ships Respond - "A Panamanian registered freighter answered one of L...'s calls and said that he was turning towards our position. Then a US warship called and said he would be in our position in 3 hours. 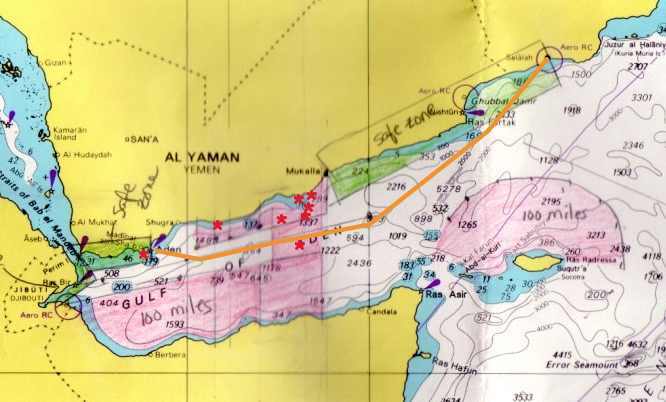 Finally the attacking boat gave up the chase and turned for the Yemen coast possibly because of the obvious long chase he was in for to overtake us, also because we were a close bunched group of five yachts, and also because he was heavily laden with "passengers". The appearance of the merchant vessel ROYAL PESCADORES heading in our direction must have also been a deterrent 9.12am a Coalition Orion 4-engined navy aircraft made contact, flew over and then headed down the coast AHEAD OF US! (The pirates were astern) On his second pass fifteen minutes later we managed to indicate to him the direction in which they had fled and he did a run in that direction. He then returned, asked if we needed any assistance, and departed. At 1050 he returned and asked for details of the yachts involved, reported that had had seen any local small vessels but could not identify our attackers." All Clear - "Thankfully we have escaped that attack unscathed and will pass the worst "danger zone" by tonight. We have 2-3 days to go before we enter the "Gates of Sorrow" at the southern end of the Red Sea and head for the relative safety of Eritrea." The continuing Autopilot saga - After testing the autopilot for several hours in Salalah, we declared it 'cured' and left on the 1200 mile passage expecting no problems. About 2 hours out of Salalah, the autopilot resumed its wandering ways, and after swinging +/- 20?and getting hot, we shut it off and went to another Plan B - as we engaged 'Casco' to steer.. This is a Rube Goldberg arrangement shown to the right where the autopilot acts like the vane, and the windvane thinks it is being steered by the wind. Judi said "No way will this work!". Much to our joint surprise it has worked well for the last 400 miles, and now is part of our options as far as steering.